Virtualization is part of the IBM® Dynamic Infrastructure® vision to build a smarter planet. IBM demonstrates leadership in virtualization and consolidation solutions that reduce cost, improve asset utilization, and speed provisioning of new services. 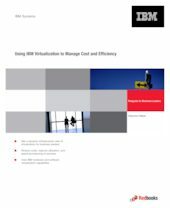 This IBM Redguide™ publication serves as both an introduction to the benefits that can be realized through virtualization and an overview of pertinent IBM hardware and software virtualization solutions to deliver that value. * The next steps to evaluating and deploying virtualization (page 35).